Bitfinex, the world’s largest cryptocurrency exchange with a $2.8 billion daily trading volume, has referred to Bitcoin Cash as BCash in a controversial letter to one of its clients, despite the community’s insistence on referring to the cryptocurrency as Bitcoin Cash. Bitmain founder Jihan Wu, early-stage bitcoin investor Roger, along with many others in the Bitcoin Cash community have iterated the critical distinction since the currency#s inception on August 1. The clarification is because the reason for the hard fork was to “continue” of Satoshi Nakamoto’s original roadmap for bitcoin development. Ultimately, they are asserting a bifurcation from bitcoin’s current philosophy. Until this month, cryptocurrency exchanges and investors have continuously described Bitcoin Cash as Bitcoin Cash. However, this month, a couple of major exchanges such as Bitfinex have referred to Bitcoin Cash as BCash on several occasions, creating confusion amongst the community and the market. For instance, New Zealand exchange Cryptopia changed the name of bitcoin cash to bcash on their platform. Bitfinix’s message was spread across bitcoin forums and social media platforms including Twitter, after Ver took offense in a debate against John Carvalho in which Carvalho referred to Bitcoin Cash as BCash several times throughout the discussion. At the Ethereum Classic summit held on November 13, Bitmain founder Jihan Wu offered a similar response to one of the attendees that referred to Bitcoin Cash as BCash, firmly stating that Bitcoin Cash is the name of the cryptocurrency that is used by the community, market, and industry. At this point, exchanges, wallet platforms, and other service providers in the cryptocurrency sector should provide clarity on the Bitcoin Cash and BCash name recognition issue. If significant trading platforms like Bitfinex consistently refer to Bitcoin Cash as BCash and then occasionally refer to it as Bitcoin Cash, it can cause genuine confusion within the community. 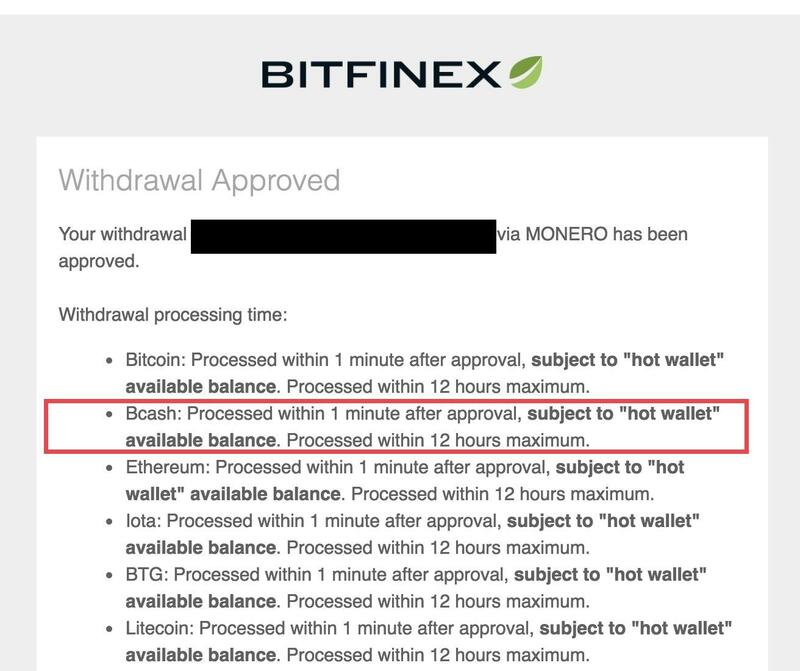 Based on its previous statements, it seems as if the description of Bitcoin Cash as BCash in a message to its clients was an error, as Bitfinex does not have a track record of referring to Bitcoin Cash as BCash in the past. However, exchanges should be more aware of the stance of the Bitcoin Cash community and decide a single name for the cryptocurrency, whether that be Bitcoin Cash or BCash.